Sr. John Marie was born in a pious family as the eldest of five girls and two boys to a God fearing couple Mr. Amirtham and Mrs. Arul Mary. They nurtured these tiny seeds with fear of God and in deep Christian faith. They played a great role in fostering in them true love and devotion to the Holy Eucharist. 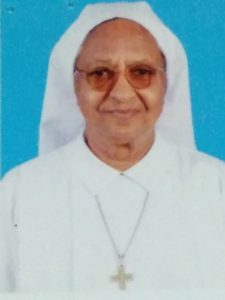 Sr. John Marie did her primary education under CIC Sisters and High School at St. Philomena’s of Seven Dolours in Trichy. God according to His pre-destined plan, gave an opportunity to this young girl to come across the Holy Cross Sisters, in her customary visit to St. Mary’s Cathedral Church at Trichy. She was very much attracted by these Sisters for their cheerfulness and realized in the depth of her heart her vocation to serve the Lord in this Congregation. Though there was resistance at the beginning from her parents yet with the guidance of the Assistant Parish Priest she joined the Congregation of the Sisters of the Cross on 21st June 1958. She made her first profession in 1960 and the final in 1965. Ever after Sr. John Marie began her service with zeal and zest. At the outset of her religious life, Senior sisters Srs. Dominic, Angela, Stepheny, Adella, Joanna and Magdelene showered upon her great love and concern which made her to taste the divine love in its fullness. In 1961 – 1962 she served as a clerk in St. Joseph’s Anglo Indian Hr. Secondary School, Cantonment after which she completed her UG at Queen Mary’s in Chennai. 1965-1967, she did her theological studies at Mater Dei, Goa. 1968-1970, she taught at Holy Cross College, Nagercoil, then at Munnar in Kerala and Tuticorin as well. From 1973 – 1999, she taught at Holy Cross College, Trichy in various capacities as Professor of Tamil Literature, Head of the Department, Vice Principal and then got retired. From 1983 – 1987 She was appointed as SIC, at Golden Rock and animated the Community with love and concern. In the year 1988 , Sr. John Marie completed her doctorate in Tamil Literature. After her retirement she served as a warden at Mambalasalai and Namakkal. She lived at Cantonment from 2002 – 2012 and at Fort 2012 – 2016. During these years she rendered her service in visiting the families, Prisoners, sick in the hospital and thus made the Good God known and loved. Sr. John Marie was gifted with many rare qualities such as establishing good rapport with the rich and poor alike. The poor found great solace in her company. She helped generously all the poor and the needy whom she came across. Her hospitality to one and all was remarkable. She rendered spiritual assistance and counselling to those in pain. She was a good administrator, very systematic and orderly in all her undertakings. She was in charge of the College Choir and animated the young catholic girls of AICUF in Holy Cross College for quite a number of years. She was a person who was well known for building up strong relationship among the staff and the families. Her talent in coordinating all cultural events of the College like dramas and dances was superb! Her youngest Sister, Sr. Metti Amirtham was attracted to this Congregation by seeing the devout life of her sister John Marie. In 2016, Sr. John Marie joined the community at Ashirvad the newly erected Home for the Seniors Sisters of our Province. Here she became a prayer warrior and led a life of contemplation for nearly two and a half years. On 25th February 2019 she went to the Hospital for her regular check-up. But realizing her condition the doctors admitted her in ICU. But despite the best treatment given her they found no improvement. During this time she was given the anointing of the sick. She constantly expressed her desire to get back to the Community. She kept on telling the Sisters, who came to see her that she could see the presence of Jesus tangibly in her room. But alas as per Doctor’s advice she was discharged at 11 pm on 5th March 2019 and was brought back to Ashirvad Community. Around 1.00 am on 6th March 2019 she breathed her last while sisters surrounding her bed were praying. It was the final and loving embrace by the Lord who sustained her over the long 79 years. Dear Sr. John Marie , though you were longing to meet your Lord, yet to us it is a great loss. With a firm hope that we will all meet in heaven one day we bid you fare well with tear filled eyes.